Events this summer have certainly confirmed Barghouti’s analysis. The brutal Israeli assault on Gaza, combined with the use of repressive force against Palestinians on the West Bank and those who are citizens of Israel, has pushed larger numbers to question the Israeli claim that even the most naked aggression is actually self-defence. Many have begun to see through the consistent media bias in favour of Israel and the hard-line support for Israel demonstrated by many governments including the Harper Tories in Canada. 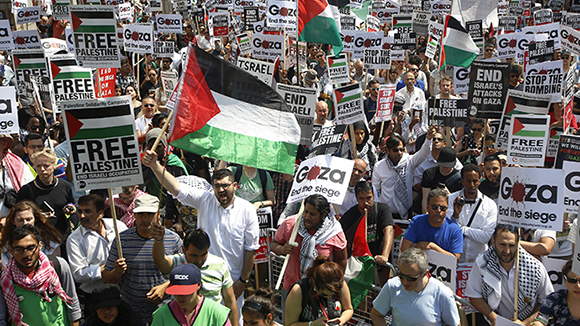 Record numbers–150,000 by some reports–rallied in London against the most recent Israeli assault on Gaza. While the surge in Israeli aggression has pushed people to raise questions, we could not reach this tipping point without the determined, patient and strategic work of the BDS movement in opening up space for a different way of understanding the politics of apartheid and occupation. 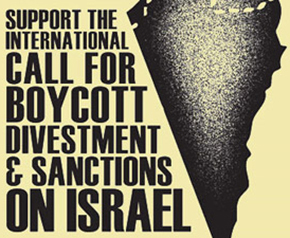 The BDS movement was launched in July 2005 with a call from over 175 Palestinian civil society organizations for a global campaign of boycott, divestment and sanctions against Israeli institutions and to support fundamental Palestinian rights under international law. Specifically, the BDS campaign focussed on three rights: an end to the occupation of the West Bank and Gaza, full equality for Palestinian citizens of Israel and the right of return for Palestinian refugees uprooted from their homes and communities. The BDS movement has made considerable headway over the subsequent nine years, building an international base of activists, winning some important victories and creating openings for Palestinian perspectives and experiences to be heard despite the attempts of Israel advocacy groups to silence such expression. It is now on the threshold of becoming a genuine mass movement as the anti-apartheid in South Africa campaign did in the 1980s. The global anti-apartheid solidarity movement of the 1980s was so successful that it seems almost obvious looking back. A successful mass movement actually shifts the way people think about an issue, sometimes so completely that it is hard to imagine there was another side. But the anti-apartheid movement of the 1980s did not come out of nowhere and sweep everyone onside. It was produced by long-term patient work against the stream to accumulate core activists and develop a movement around the idea that if apartheid was wrong, people around the world had a responsibility to act in solidarity. In the late 1970s and 1980s the movement broadened into a mass movement, driven forward by the increasing mobilization of black South Africans and building on long-term international solidarity work. I remember when I arrived at the University of Windsor in 1988, the campus reverberated with the politics of anti-apartheid. The faculty union was in the midst of great debates leading up to the decision to endorse pension fund divestment from corporations operating in South Africa. Students were pushing the university to divest, leading to a large walkout from classes and a campus rally of thousands. Trade unions on and off campus were allied with the anti-apartheid movement by that point, as were many student unions. Mainstream media, labour press and student papers covered the movement. When Omar Barghouti refers to the “South Africa moment” for the Palestine solidarity movement for BDS, he is inviting us to think on this scale. Often throughout the history of the 20th century, a key liberation struggle became the signal movement for a broad movement that galvanized many into activism. At various times, struggles in Algeria, South Africa and Vietnam played that role. This does not mean that they were the only important issue globally, but that they attracted the critical mass of activists that cracked open the seemingly impregnable foundations of exploitation and oppression. Palestine solidarity is becoming such a signal movement at the present time. There are already important signs that the BDS movement is reaching a new threshold. A number of university student unions have already endorsed BDS, as has the Canadian Federation of Students-Ontario, an organization of affiliated student unions. In March 2014, students at the University of Windsor voted in a referendum that their student union should endorse BDS. To continue this momentum towards a mass movement, BDS organizations need to mobilize a lot of activists who can think strategically, argue convincingly and build effective mobilizations that engage others. At the early stages of movements against the stream, a great deal of the work is often carried by a small core of activists who are deeply committed and knowledgeable. Becoming a mass movement means figuring ways to engage broader layers of people who are drawn towards Palestine solidarity, actively inviting them in and providing them with the opportunities to develop their confidence and abilities. As a result of the Israeli assault on Palestine over the summer of 2014, every campus will have a small layer of students this fall who feel drawn to the cause of justice for Palestinians. Every trade union and community organization will have some members who feel the Israeli state has committed a profound injustice. In these same settings, a much larger number of people will be troubled by these events, even if they have not yet decided it is time to act. The smaller layer already considering active solidarity will develop into activists only if they are invited into the movement and offered the opportunity to develop their own knowledge, confidence and abilities. If this does not happen while the memory of this summer is fresh, they might not make the transition into activism. Unfortunately, this is a political moment in which it is hard to become an activist, as movements are fairly small and most people are dedicating their energy just to getting by in these difficult times. It is not safe to assume that activists who want to be involved will find us. This is also an important time to address the large numbers of people who are troubled by the events of the past summer and pushed to think about the politics of Palestine/Israel. It is a moment to be confident and creative in terms of educating outwards. Many people have simply not had the opportunity to hear about Palestinian experiences and realities, given the character of coverage in the mainstream media, the pro-Israel alignment of governments and the silencing strategy of Israel advocacy groups. This is a time to be inviting people to panels, film showings and debates where there is lots of opportunity for discussion. Finally, it is a time for audacious alliance-building in the move to pass more BDS resolutions in broad-based democratic organizations such as student unions, trade unions and community organizations. This alliance-building needs to be patient, as it often takes a longer-term strategy with a number of steps to win organizations over to BDS. The first motion that is feasible in a specific organization might be simply to call for an investigation into the situation of Palestinians and questions of complicity. A careful read of every organization and many discussions with potential allies will help determine what is possible at the moment. The best kind of motions do not stop at formal adhesion to BDS, but commit organizations to active investigation and member engagement around the issue. The Canadian Union of Postal Workers, for example, has sent delegations of union members to see the situation in Palestine with their own eyes and report back, while also making ties with equivalent trade unions in Palestine. This active movement building can build on the solid political experience of the BDS campaign to date. There are three keystones to the movement that are crucial for ongoing success. First, the call for BDS originated with Palestinian organizations, not as a substitute for their own mobilization but as a support to it. The BDS movement will be most effective if it recognizes the leadership of Palestinians in the movement and the centrality of Palestinian rights. This commitment to Palestinian leadership in no way restricts participation in international solidarity activism, but recognizes that this work is there to support the movement of the Palestinian people themselves. This commitment was clear in the large and sustained Gaza solidarity mobilizations around the globe and across Canada in the summer of 2014, including those in Toronto organized by the Coalition Against Israeli Apartheid (CAIA) with Palestine House and other allies. Secondly, the movement has sought to build solidarity on a firm foundation of challenging oppression and injustice. This means building feminism, anti-racism, anti-colonialism, class justice politics, queer liberation and struggles against islamophobia and anti-semitism right into foundations of the movement. It is on this basis that we can build effective alliances, recognizing that the oppression of Palestinians is one link in the chain of a global system of inequality. 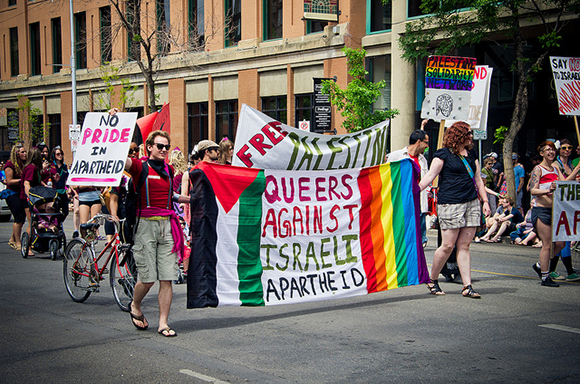 This foundation is clear in the work of Queers Against Israeli Apartheid (QuAIA) aimed at exposing pinkwashing strategies that attempt to hide the oppression of Palestinians behind an image of Israel as cosmopolitan and gay-positive. QuAIA has worked with others to link this anti-pinkwashing work with worker solidarity, for example, at Labour Day in Toronto 2014. Finally, the movement needs to be strategically supple and thoughtful. The overall goal of the BDS movement is victory, not glorious defeat in which a small number of activists take a pure and principled stand and lose badly. Victories most often come with focussed local campaigns around clear international BDS targets where activists can make a clear and compelling case for those new to the issue, such as the Sodastream boycott organized by CAIA. This orientation towards victory means building a movement that can learn through serious reflection on both its successes and failures. It means having the confidence that even organizations where it might seem impossible to pass a BDS motion right now can be convinced with a thoughtful approach over time. The careful work of alliance-building in trade unions as practiced by CAIA and Labour for Palestine meant that prominent labour leaders such as Marie Clark Walker (Vice President of the Canadian Labour Congress) and Sid Ryan (President of the Ontario Federation of Labour) spoke out at recent Gaza solidarity mobilizations. The confidence to believe victory is possible comes from the conviction that the Palestinian case for justice is powerful and from identifying our victories to date, that remind us that BDS is winnable. The complicity of governments, corporations and academic organizations in the Israeli oppression of Palestinians creates a responsibility to act so injustice is not done in our name. The challenge for the movement is to find effective and creative ways to make our case as we build alliances with others fighting injustice and to persuade mass-based organizations to actively join the BDS campaign to exert ever greater pressure on the Israeli state. Alan Sears is a member of Toronto New Socialists and Faculty for Palestine. He is author of The Next New Left: A History of the Future.